In Advent we wait for the coming of Christ. At Christmas we celebrate Jesus' birth. 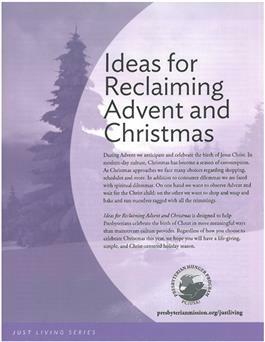 Shape your seasonal celebration to be one centered on the true meaning of Christmas. Prepare for the holidays by simplifying life, incorporating prayers, giving alternative gifts and serving sustainable foods. Share the love of Christ with others throughout your life with a living witness this season. Part of the Just Living series from Enough for Everyone and the Presbyterian Hunger Program.